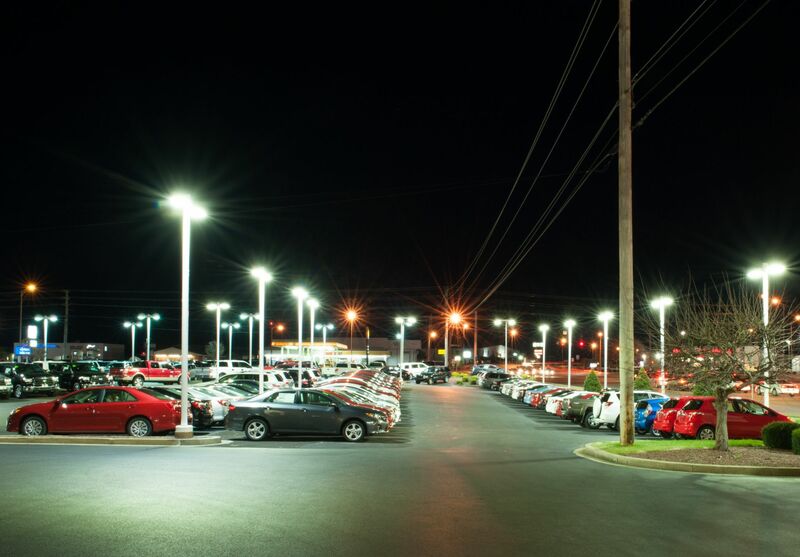 When car dealerships try to outshine each other through the use of bright light on their lots, much of the illumination is wasted off the lots’ parameters. While these lights serve a dual purpose of attracting potential customers and as a 24/7 security system, they also devour energy. Optimized illumination performance enhances the appearance of vehicles. Automakers have been climbing aboard the ‘green’ bandwagon for years, with low-emission, high-mileage vehicles that appeal not only to customers looking to save fuel, but also to buyers eager to participate in what is perceived to be an environmental solution. Now, dealerships are following suit. However, dealerships with large parking lots, numerous buildings, and 24-hour demand for light have energy challenges. One potential technology for car dealerships is the light-emitting diode. Light-emitting diodes (LEDs) differ from traditional light sources in the way they produce illumination. In an incandescent lamp, a tungsten filament is heated by electric current until it glows or emits light. In a fluorescent lamp, an electric arc excites mercury atoms, which emit ultraviolet (UV) radiation. After striking the phosphor coating on the inside of glass tubes, the UV radiation is converted and emitted as visible light. An LED, in contrast, is a semiconductor diode. It consists of a chip of semiconducting material treated to create a structure called a positive-negative (p-n) junction. When connected to a power source, current flows from the p-side (i.e. anode) to the n-side (i.e. cathode), but not in the reverse direction. Charge-carriers (electrons and electron holes) flow into the junction from electrodes. When an electron meets a hole, it falls into a lower energy level, and releases energy in the form of a photon (light). All light sources convert electric power into radiant energy (i.e. visible and invisible light) and heat in various proportions. Incandescent lamps emit primarily infrared (IR), with a small amount of visible light and heat. Fluorescent and metal halide sources convert a higher proportion of the energy into visible light, but also emit IR, UV, and heat. As a relatively new technology, LED luminaires currently cost more to purchase than traditional fixtures lamped with high-pressure sodium or metal halide light sources. 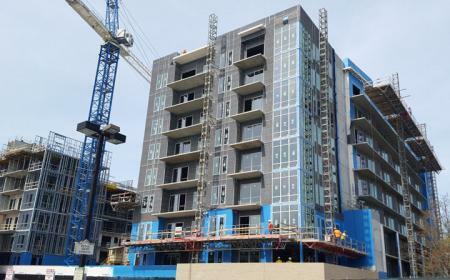 However, the reduction in relamping expense and increase in energy savings typically lower overall lifecycle cost by about 50 percent. Exterior LED luminaire technology has turned the corner from specialty applications to general illumination. Powering this important change is a combination of performance improvements in the core technologies, introduction of a wide range of well-designed products, and continued cost improvements. The design of LED luminaires is a new world compared to traditional light fixture design. Optical, thermal, and power supply characteristics have a drastic effect on the longevity, performance, and affordability of light fixtures using LEDs. The generation of luminaires using LEDs dictates the need to harness and manage as much of the light energy as possible. Misdirected illumination usually means wasted light, requiring the need to engineer even more initial light to reach target deliverable light levels. Of course, generating a greater amount of light means higher costs and more heat generation, and if poorly managed, can reduce fixture life. To minimize the number of LEDs used its important to employ high-performance engineered optics, which allow for more efficiently captured and managed light. The result is superior light distribution with less waste. 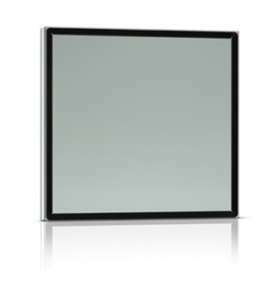 LED luminaires using high-quality optics are far better at improving light uniformity than any other technology available today. The prognosis is positive. LED luminaires’ efficacy continues its overall upward progression, doubling in the past two years among tested solid state lighting fixtures. Further, color quality is also steadily improving, making exterior LED luminaires a viable alternative to traditional sources. The bottom line for LED lighting systems is they have the potential to save a substantial amount of energy costs for lighting over the lifetime of a project. In addition to the energy savings, the long life of LEDs in well-designed systems will result in significant reductions in both labor and material costs for maintenance. 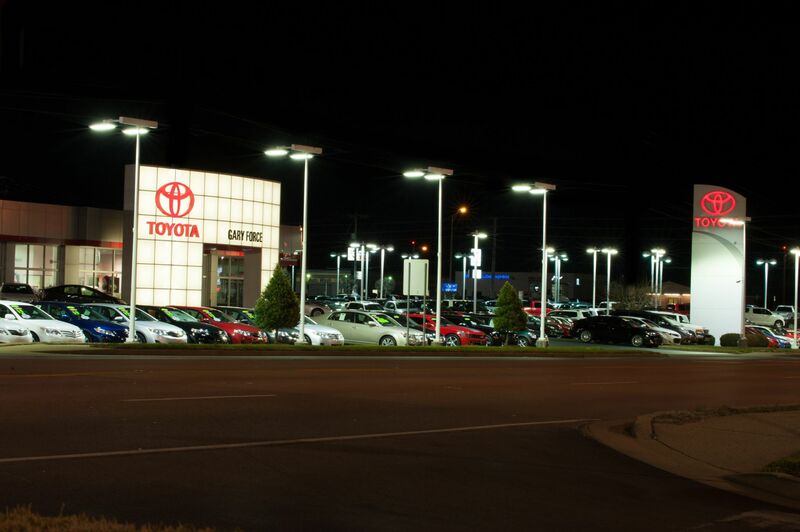 These photos show Gary Force Toyota’s lot illuminated with traditional metal halide fixtures. A total of 63 of the 1000- W fixtures were replaced with 240-W light-emitting diode (LED) luminaries for dramatic energy savings. Additionally, in 2013 the Go Green energy assessment became an integral component of the U.S. Ford facility renovation program. The company’s goal to renovate more than 700 U.S. Ford Motor Company branded facilities during the next few years presented a tremendous opportunity for green technology implementation within the dealer network. Ford is not the only car company with sustainable dealership initiatives. Nissan Green Shop Activities include various environmental efforts that take place at Nissan Motor dealerships across the globe, including reducing waste, recycling, and energy saving endeavors. The program was introduced in April 2000 as an environmental management system for all Nissan dealerships. Something that dealerships in these programs implemented is energy-efficient lighting, which provides one of the quickest paybacks. 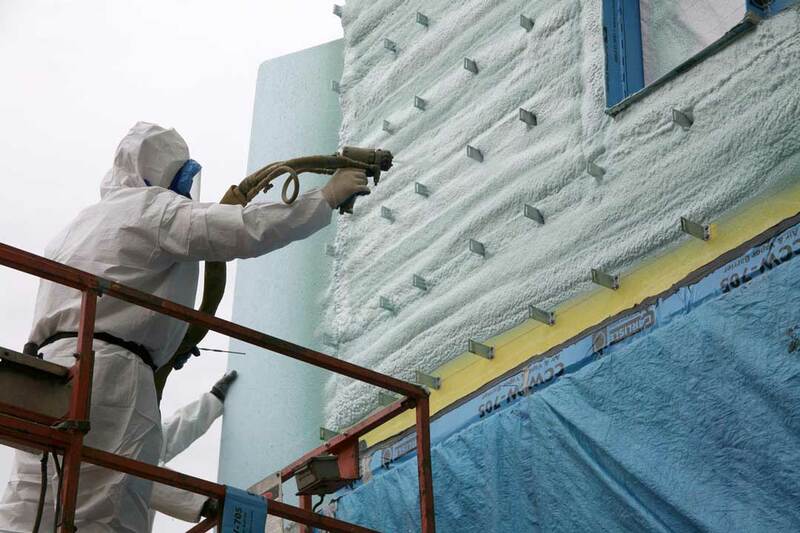 Utility companies around the country are encouraging these efforts by offering energy-efficient lighting upgrade and replacement rebates, some of which cover up to 50 percent of installation costs for retrofits. 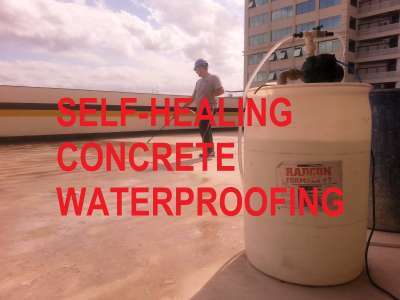 Most utility rebate programs are offered on a first-come, first-served basis until funding is exhausted or the program is discontinued, so it is important for customers to get applications in early. custom rebates are based on the total energy savings of a specific lighting retrofit. Custom rebate programs offer payments for both actual energy savings (kilowatts saved per hour) of upgrading to more efficient lighting technologies and reductions in peak demand (kilowatts) achieved in the first year after implementation. This photo shows Gary Force Toyota’s lot after the replacement. The installation of LED luminaires enhances the appearance of the vehicles. The new exterior lighting allows the dealership to decrease operating expenses. 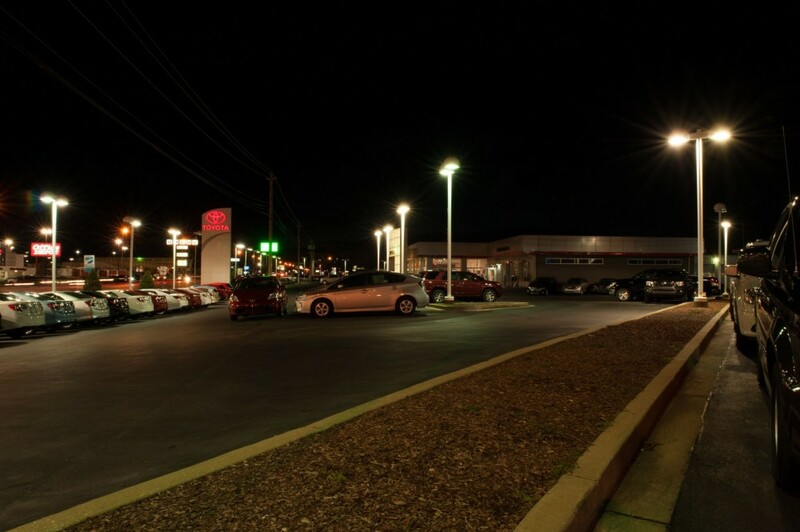 Energy-efficient LED area lights transform Gary Force Toyota’s parking lot and are virtually maintenance-free. Established in 1973, family-owned Gary Force Toyota is part of three award-winning auto dealerships. Based in Bowling Green, Kentucky, the dealership is committed to incorporating sustainable products into the facilities. 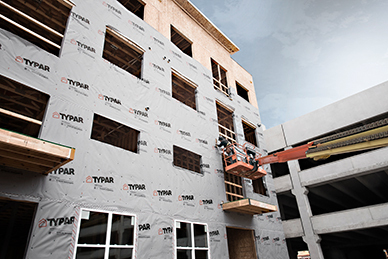 As a long-established business, the owners and management team knew they could make a strong environmental statement while also attracting customers. Car dealership lots use a tremendous amount of energy and install many light fixtures to illuminate the cars outside at night. Gary Force Toyota sits on a 0.8-ha (2-acre) lot with a 210-car inventory, and an 1858-m2 (20,000-sf) showroom and repair shop. The dealership recently replaced 63 of the old 1000-W metal halide fixtures in the exterior lot with the same number of 240W LED luminaires. 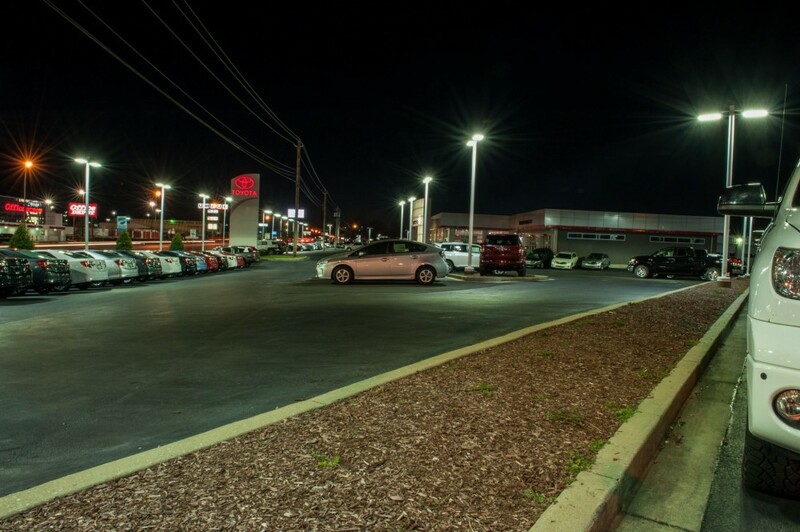 The dealership also replaced six 250W metal halide wall packs with six 60W LED wall packs. The impetus for the LED retrofit was the dramatic energy savings. 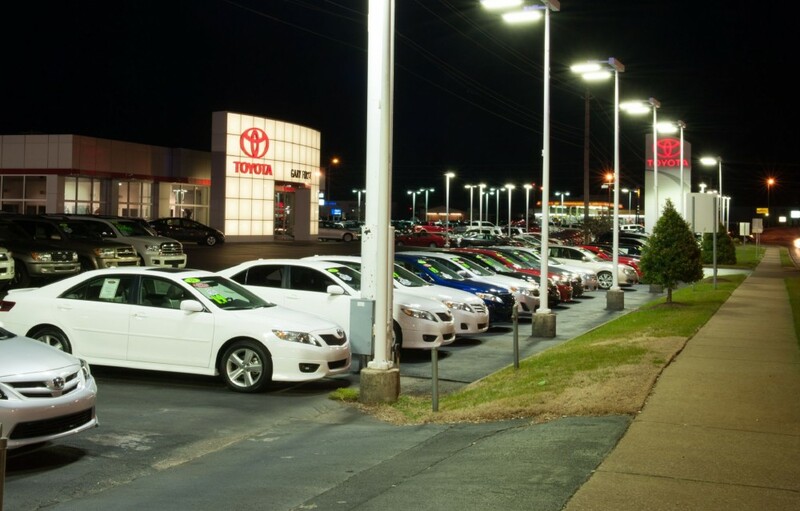 Previously, the dealership was spending almost $30,000 annually on utility costs, however, with the new luminaires, their energy costs will be reduced to approximately $6620. Additionally, every three months, about 12 of the metal halide fixtures needed maintenance, costing $26,400 in maintenance over five years. Now, the new LED luminaires are virtually maintenance free with a five-year warranty. After seeing the product, learning about the energy savings—greater than 70 percent over the metal halide—and determining the dealership would have just a two year return on investment (ROI) on the LED lights, it was an easy decision. The Tennessee Valley Authority also provided an incentive of $21,700 for upgrading the fixtures to LED. The LED luminaires provide consistent light levels, reduce hazardous waste disposal, and provide dramatically more efficient light distribution than the metal halide fixtures. “The new exterior LED lighting allows us to drive down operating expenses, present our cars in the best light, and contribute to the greening of our community,” said Dave Stumbo, owner and vice president/general manager. Both employees and customers have noticed the bright, white lights and have commented about how much easier it is to see the cars, anywhere in the lot. Additionally, the lights did not disturb surrounding businesses or residential areas. Many LED fixtures are designed for full cut-off. This means little to no light is emitted above the horizontal plain, therefore minimizing light pollution. To curtail light trespass (i.e. light extending beyond property lines and other boundaries) it is important to use fixtures with the right distribution patterns for the required area. There are numerous factors contributing to dealerships’ sustainability efforts, such as manufacturers’ national initiatives, consumers’ increased concerns about environmental issues. An environmentally conscious car dealership seems to be contradictory term. However, the bottom line is that by living and working sustainably dealerships can reduce energy costs, increase their brand/dealership’s recognition, and attract more customers. Renovations such as LED lighting retrofits or the installation of light-emitting diode luminaires uring new construction are an excellent way for car dealerships to begin achieving their sustainability objectives. 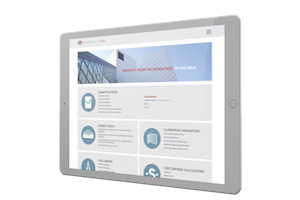 Jeff Gatzow is national sales and marketing manager, lighting with Optec LED Lighting. He has worked in the LED luminaire industry for over 10 years, and prior to this he worked in the illuminated signage/brand identity industry. Gatzow can be reached by e-mail at jgatzow@optec.com.